By CNN'S MANU RAJU, SARAH MUCHA, KARA SCANNELL, ERICA ORDEN, MJ LEE, GLORIA BORGER, LAUREN FOX AND ELI WATKINS CONTRIBUTED TO THIS REPORT. (CNN) - President Donald Trump's former lawyer Michael Cohen announced he is postponing his public congressional testimony that was scheduled for February 7, citing "ongoing threats against his family" from the President and his attorney Rudy Giuliani. A source told CNN on Wednesday that Cohen's wife and father-in-law feel threatened by comments by the President and Giuliani, Trump's attorney. It has been Cohen's intention to testify, but he has had reservations — and vacillated — because of concerns for his family given the Trump and Giuliani statements, the source said. Asked Wednesday about Cohen citing threats against him and his family, Trump said: "Well I would say he's been threatened by the truth. He's only been threatened by the truth." Cummings told reporters that he believed Cohen was acting in good faith, but he was determined to have Cohen testify one way or another. Cummings said he hadn't decided yet whether to issue a subpoena. "I promise you we will hear from Mr. Cohen. Now, we will make those determinations soon and we will let you know how we plan to proceed, but we will get the testimony as sure as night becomes day and day becomes night," Cummings said. Asked if he could get Cohen to testify after he's already in prison, Cummings said: "Of course we can." Cummings and House Intelligence Chairman Adam Schiff -- a California Democrat who wants Cohen to return to his panel for closed-door testimony -- issued a joint statement slamming Trump and Giuliani for "efforts to intimidate witnesses, scare their family members, or prevent them from testifying before Congress." "We understand that Mr. Cohen's wife and other family members fear for their safety after these attacks, and we have repeatedly offered our assistance to work with law enforcement to enhance security measures for Mr. Cohen and his family," Cummings and Schiff said. "When our Committees began discussions with Mr. Cohen's attorney, not appearing before Congress was never an option," Cummings and Schiff said. "We will not let the President's tactics prevent Congress from fulfilling our constitutionally mandated oversight responsibilities. ... We expect Mr. Cohen to appear before both Committees, and we remain engaged with his counsel about his upcoming appearances." After Cohen's public testimony was announced earlier this month, the President attacked him in a Fox News interview, suggesting without evidence that he was aware of damaging information about Cohen's family. Then on Twitter, the President added: "Lying to reduce his jail time! Watch father-in-law!" Giuliani appeared on news shows over the weekend, including CNN, where he called Cohen "a serial liar." On CNN's "State of the Union," host Jake Tapper asked Giuliani how Trump's repeated calls for investigation into Cohen's family members ahead of Cohen's previously scheduled testimony did not amount to intimidating a witness or obstruction of Justice. "We are so distorting the system of justice just to get Donald Trump, it's going to hurt us so much," Giuliani responded. When Tapper asked if it was OK to go after Cohen's father-in-law, Giuliani responded, "it is, if the father-in-law is a criminal." In December, Trump was asked in a Fox News interview about Cohen's cooperation with special counsel Robert Mueller, and he suggested that Cohen had cut a deal "to keep his wife out of trouble," as well as his father in law. "Inaccurate. He knows the truth, I know the truth, others know the truth, and here is the truth: The people of the United States of America, people of the world, don't believe what he is saying," Cohen said. "The man doesn't tell the truth. And it is sad that I should take responsibility for his dirty deeds." But prosecutors in New York had threatened Trump's ex-lawyer with numerous more counts that could have also implicated his wife and also raised the possibility of his assets being seized, CNN has reported. In the Manhattan US Attorney's case against Cohen, he pleaded guilty to five counts of tax fraud related to his taxi-medallion business. Cohen's taxi business was linked closely to his family members, including his father-in-law, Fima Shusterman, from whom Cohen bought some medallions, CNN previously reported. Shusterman, who emigrated from Ukraine, pleaded guilty in 1993 to a financial crime relating to the taxi business, according to court records. During the course of his taxi medallion purchases, Cohen and his wife took out several loans of unspecified value, putting up the medallions as collateral, according to CNN reporting. 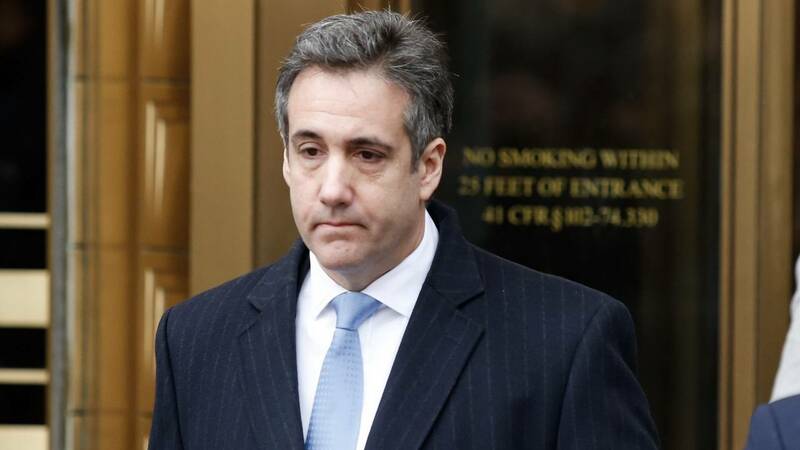 His wife, Laura Cohen, wasn't named in the search warrant that was used to obtain records of Cohen's loan documents and other taxi-related paperwork, CNN has reported. Democrats on the Oversight Committee say they expect Cummings will follow through with a subpoena. Rep. Stephen Lynch, a Massachusetts Democrat, said that he's spoken with Cummings and the "overwhelming consensus" among members of the committee is that Cohen should be subpoenaed. Lynch said that Cummings was still conferring with Democrats on his panel before making a final decision. "I believe Chairman Cummings will institute the process of subpoenaing," Lynch said. "He is conferring with other members of the committee right now, but so far I believe the overwhelming consensus is we should move forward with a subpoena." "I would support the issuance of a subpoena, however reluctantly," Connolly said. "This is not a reluctant witness, at least up until now, and the reason for his reluctance isn't our committee, it is the client he fears puts his family at risk." Before the postponement, Cummings had said that Cohen would not testify on matters related to the ongoing special counsel investigation, and that he was in consultations with Mueller's office. But congressional Republicans criticized Cummings for scheduling a hearing with Cohen, accusing Democrats of "political theater." Rep. Jim Jordan, the top Republican on the Oversight Committee, said the decision to subpoena Cohen was up to Cummings. But Jordan and Rep. Mark Meadows issued a letter Tuesday raising questions about the usefulness of Cohen's testimony when many topics were off-limits, citing a conversation they had with Davis. Meadows dismissed Cohen's concerns that he was being threatened by the President. "No, you're talking about one tweet," Meadows said. "I can say that a congressional hearing that is narrow in scope is not a real congressional hearing. So you don't get to come in and just talk about your feelings about somebody and not have a real robust back and forth."